One of the best ways to ensure the health and beauty of your landscaping is with a well-designed, professionally-installed irrigation system. Hand watering, or the use of a more traditional sprinkler system, is not only time-consuming, but also wasteful. With an irrigation system, just the right amount of water is delivered where and when you need it. The team of knowledgeable, dedicated experts at Lawrence Landscape has been providing homeowners throughout the Lawrence, KS area with high-quality irrigation and landscaping services for over 30 years. We know what it takes to keep your lawn looking beautiful all year long! We are proud to be the only local landscape company to include certified technicians accredited by the National Association of Landscape Professionals among our staff—a designation awarded to less than one percent of all landscape professionals! 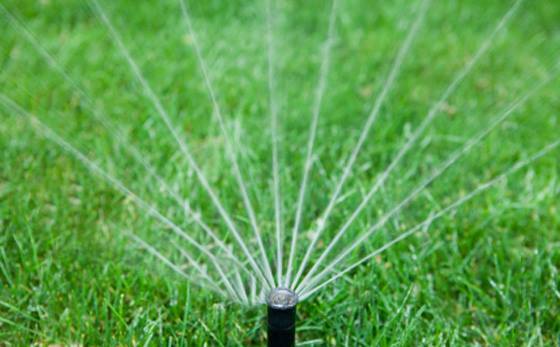 Contact us online to get professional irrigation services for your Lawrence home! Additional design options include solar sync control systems or rain sensors for increased efficiency and reduced waste. Each of our systems is outfitted with a remote plug so that seasonal maintenance, such as startup in the spring or fall, can be performed without the need to schedule an appointment to meet with a technician on-site. Since our founding in 1987, we have installed countless irrigation systems in and around the Lawrence area. In an effort to provide the highest-quality product on the market today, we use only Hunter Irrigation products on each of our commercial and residential installations. These installations include the Pharmacy Building at the University of Kansas, central campus improvements at Baker University, and the Clinton Lake Softball Complex. We also install irrigation systems for the best home builders in Lawrence, including Rod Laing Construction Company, Huston Homes, Salb Construction, and Denning-Santee Construction. If you need a new irrigation system installed in the Lawrence area, contact us online! Like many components in and around your home, your irrigation system requires periodic maintenance in order to ensure reliable, efficient performance. At the beginning and end of the growing season, our experienced, knowledgeable crew of experts performs spring turn-on and back flow testing, and fall irrigation winterization. Our commercial and residential customers appreciate the efficiency of our irrigation maintenance procedures, which can also help detect and prevent issues before they arise. For the past 30 years, the team of experts at Lawrence Landscape has worked hard to earn our stellar reputation for excellence in landscape services, including irrigation. We use only the finest quality products, embrace the latest technology, and hire dedicated, experienced, professionals to ensure complete customer satisfaction on each and every project. For superior irrigation design, installation, and maintenance in Lawrence, Kansas, contact us today and let us know how we can help!